My younger daughter is 7 month old now. She likes rattle toys and books (chew on them, open and close them). 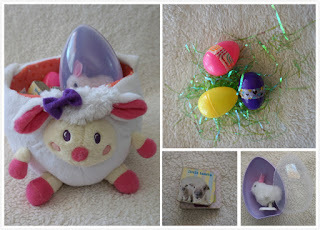 I've got some very simple and cheap goodies for her first Easter. Hope you get some ideas and inspirations. Basket was purchased from local Target, last year Easter clearance, 90% off. It is such a soft fluffy basket for this little girl who chews on everything. big purple Easter egg is M&M Easter candy egg. I enjoyed the candy myself. Just wind it up and let the little one watch the bunny hop. She already got into the tiny books when I was preparing her basket. That is how you can tell she likes it. Both of these eggs are rattle toys that make gentle but interesting sound. This is how the lightening egg looks like when it is slightly dark. Her small basket is full now. Can't wait for her too see the whole thing this Sunday.